A picture is worth a thousand words. Let us make your old table new again. 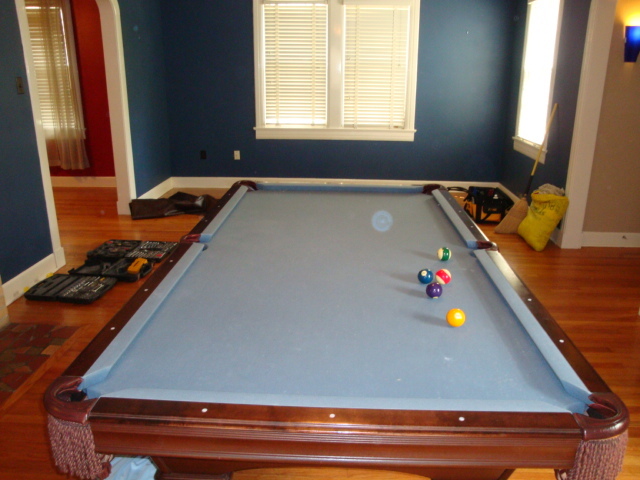 We will refinish damaged surfaces, replace bad hardware, and repair structural components. Also, we can resurface your cracked, chipped, or broken slate. 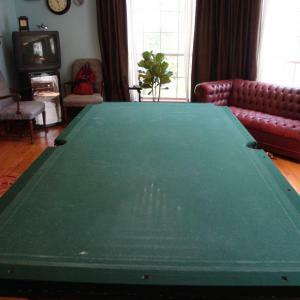 After new cushions and a fresh bed of cloth your table will play like its very first game. Your old table is still very beautiful. Let me show you. This table was also newly equipped with Championship Pro-Am cushions. Look at this table, absolutely unbelievable! This is definetely the sweetest recovery job yet. My favorite part is all the smiles at the end. Yet, another satisfied customer! This table was at least 27 years old and it's like new again! "Can you have it done by tomorrow?" Behold a fresh set of marine blue cloth and new championship pro-am cushions. We deliver excellent service just in time for the superbowl. This one tops the cake. 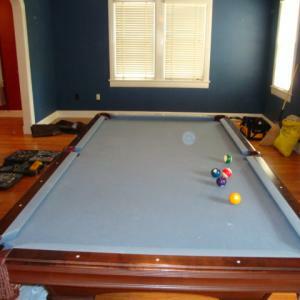 We did this one for a couple of grandparents who wanted to restore their childhood pool table so that their grandchildren could use it. I was told that this table is from 1912! 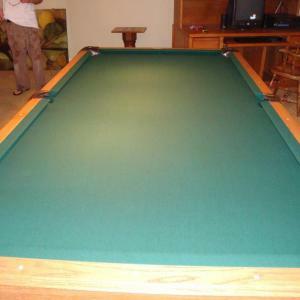 It now features stunning avanzato pecan Went Co. iron pockets and standard green billiard felt. Give us a call and we'll restore your antique today. 9' Brunswick unknown antique c.
This one was done at beautiful Audubon Park in Metarie, LA. This was quite the job. We even needed special tools to manipulate the outdated hardware. I love all the mother of pearl inlay, seen throughout the table woodwork. These are my favorite jobs. 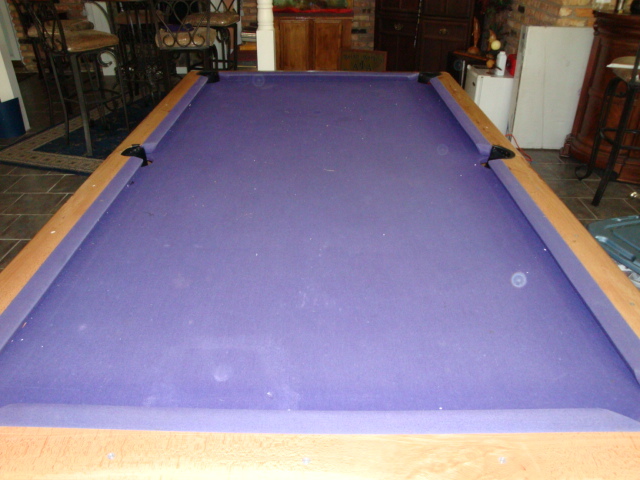 Let us restore your antique today! 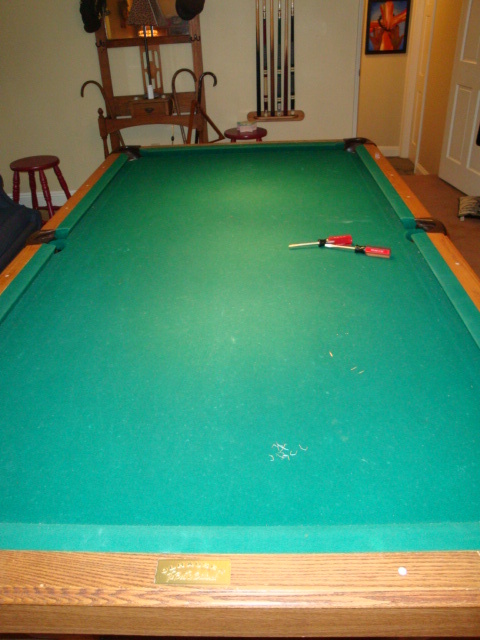 9' Gandy Sportsman - disassemble, move, & reassemble in new cloth. ...abandoned, outside for 11 years! ...Perfect! I can do this to your table. This table was left outside, upstairs in a barn, for the last 11 uears! 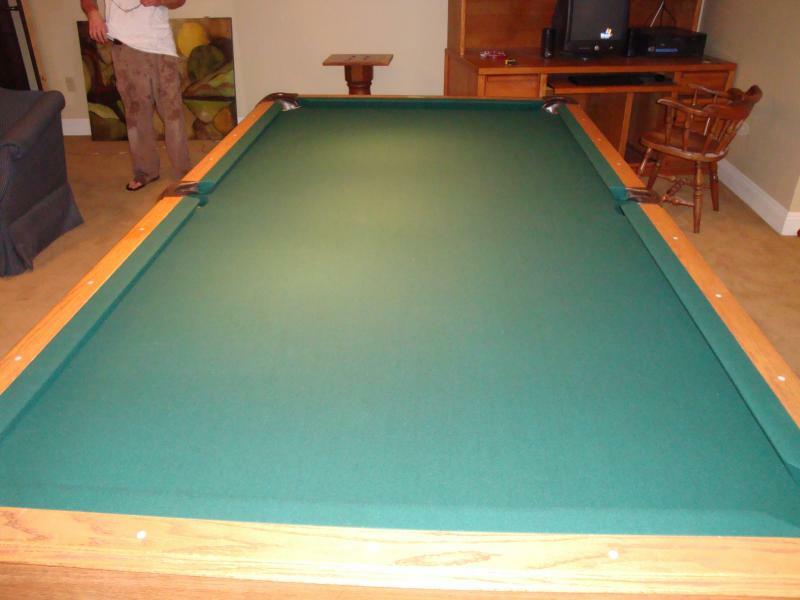 We re-installed it at a new property with Simonis green felt. I want to thank Mr. Prudhomme and his wonderful friends. These were, by far, the nicest and most genuine people I have ever met. This table needed a lot of work. 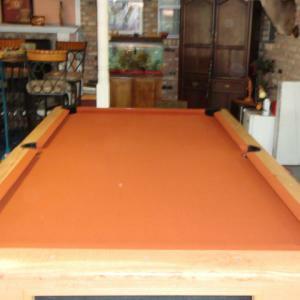 AFTER - Championship mustard billiard felt. Originally installed improperly, this Brunswick Manchester wasn't level, the felt was extremely loose, and it slates weren't even close to seamless. It couldn't have played a very good game. I have never seen so much trash within a coin-op. Recovered in green, high-speed tournament felt. Thank you, Ralph. We appreciate your return business. Pass the word, sir. Just look at her. 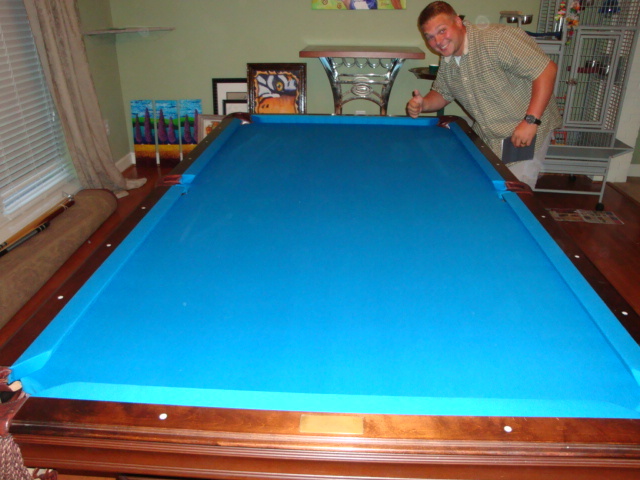 If your table is in similar shape, why not let us bring it back to life. Now, that's the way she's supposed to look. 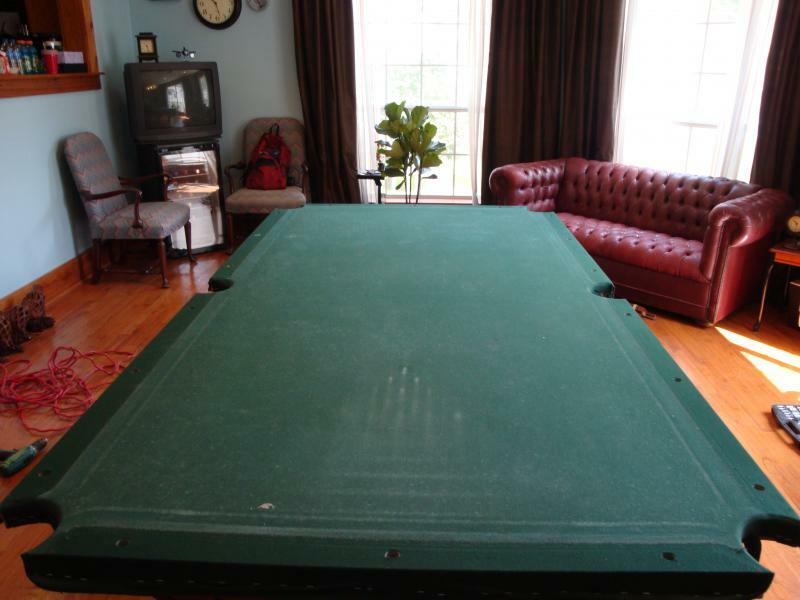 You owe it to yourself and your antique, heirloom pool table. Let us restore yours today. We are hard at work. Back from the dead, she lives to play again. Servicing these older tables requires an extra measure of special care. Don't let just anyone tinker with your valuable piece. Previously covered in Mali DARK GREEN. We did this as a surprise for a sweet lady's husband. 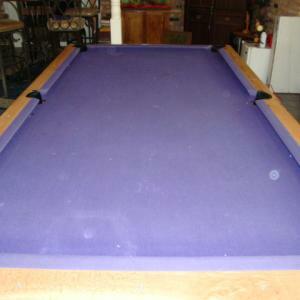 If you are struggling to find a gift and your pool table has been neglected, why not some fresh cloth or cushions. My customers are the coolest people on earth. Marcus, you are the man. We are definitely gonna bbq it up soon. Thanks for everything. 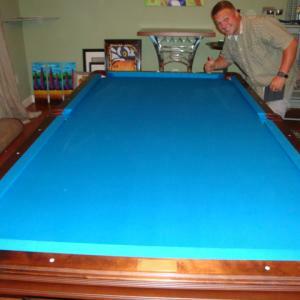 We disassembled this table in Baton Rouge and moved it 600 miles to S. Carolina. This was quite the crazy job, but it proved to be a lot of fun. 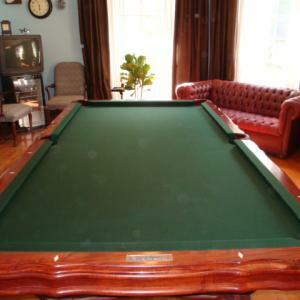 We specialize in moving pool tables no matter what the distance may be. The drive was very scenic. It was kind of relaxing. This table's cushions were falling off the rail when I first got to them. 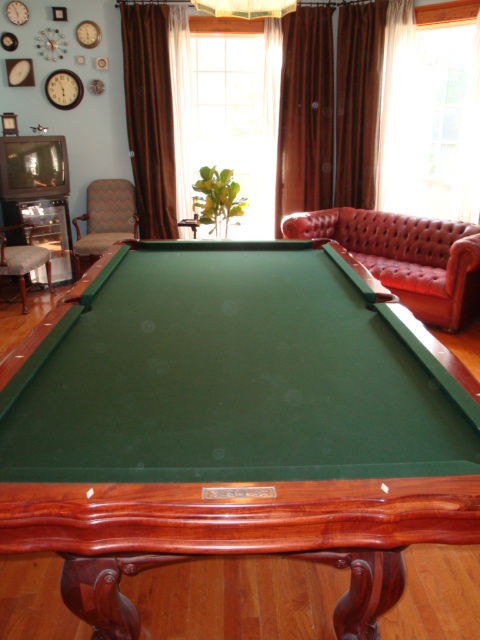 Now, the table features a fine set of Championship K66 Pro-Am billiard cushions and brand new camel cloth. We are extracting the slate screws. This was a fun job. A fat, white pig named Wilbur lived here. Unfortunately, he never did let me pet him. Call us today for a free quote. 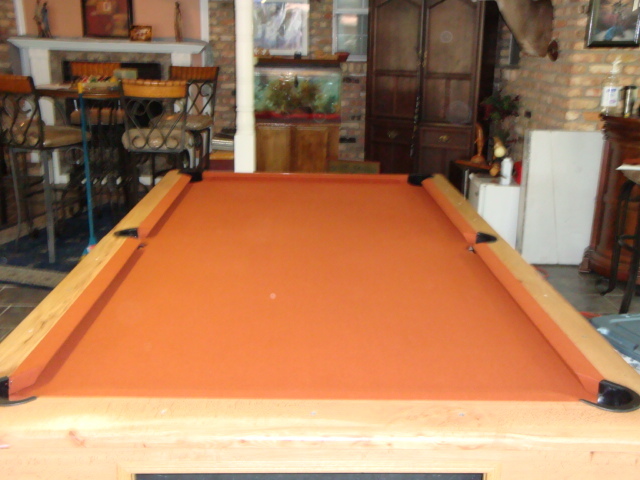 We will completely transform your pool table. 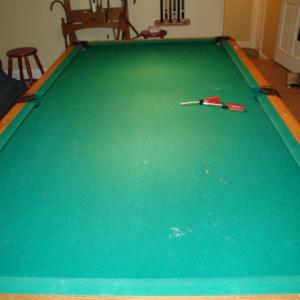 Is your pool table unused and feeling neglected? Bring her back to life! It only takes $300 and a few hours to make her beautiful again.